Accueil Produits Bande originale La bande originale de “Casanova”. La bande originale de “Casanova”. Sortie : 13 décembre 2005. An Untold Story – Assaggio No. 1 In G Minor – 2:32. The Legend Of Casanova – Tambourins I/II From Daro – 2:01. I Yield To Love – Cello Concerto No. 3 In D Minor – 1:01. Eternal Damnation – Overture From Les Fetes De Polymnie, Overture From Platee, Overture From Zoroastre – 2:20. The Doge’s Decree – Concerto In C Major – 0:44. A Venetian Virgin – 1:36. San Cremori At Dawn – Concerto In C Major For Harpsicord And Strings – 0:41. A Lover’s Duel – Overture From La Madrilena – 1:23. A Terrible Mistake – Concerto a 5, Op. 9, No. 4 – 1:57. A Secret Lover? – Sinfonia From The Opera Farnace – 1:54. Marriage Is A Safe Haven – Concerto a 5, Op. 9 No. 4 – 1:40. Trailing Guardi – Sonata For Violin And Bassocontinuo, Op. 5 No. 11 In E Major – 0:37. The Noble Pig – Concerto Per Quartetto No. 8 – 2:18. Paprizzio’s Arrival – Concerto a 5, Op. 9, No. 2 In D Minor – 2:00. With My Hopes – Concerto a 5, Op. 9 No. 4 – 1:12. A Big Idea – Harpsicord Concerto In B Flat – 0:27. A Nom De Plume / Carnivale! – Bouree From Les Plaisirs Champetres – 1:26. The Plume’s Nom Is Casanova! – 1:34. Dancing At The Doge’s Ball – Rigaudon From Water Music Suite, No. 3 In G; Bouree From Music For Royal Fireworks And Loure From Tafelmusik 1 – 2:57. One Step Closer To Heaven – Concerto a 5, Op. 9 No. 4 In A – 3:05. 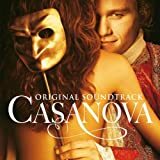 Casanova’s Confession – Sonata Op. 5 No. 7 In D Minor – 1:30. The Hanging – Violin Concerto “Il Cimento Dell’armonia E Dell’invenzione” Op. 8 No. 11 In D Major – 2:27. A Great Escape – Overture From Zais, Overture From Nais, Overture – 1:33. My Place Is With Casanova – Overture From Le Temple De La Gloire; Overture From Zais And Arcangelo Corelli – Sonata For Violin And Bassocontinuo, Op. 5 No. 7 In D Minor – 2:37. All’s Well… – Concerto A 5, Op. 9, No. 4 In A – 2:43.